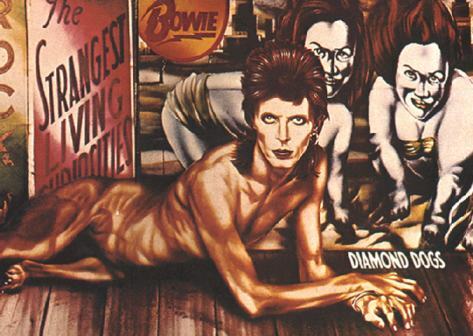 The new cover of the Lady Gaga record brought me back into the classic 1974 David Bowie album “Diamond Dogs”. He transforms into an animal. On the new Lady Gaga, she transforms into a piece of machinery. Bowie is classic rock and Gaga is going after a concept record that is classic and has longevity. Only time will tell if Born This Way is a “Future Legend”. This entry was posted in Visual Alert. Bookmark the permalink. That’s history repeating itself again, like the song Born This Way, sounds a lot like Madona’s Express Yourself!!!! Love the cover!